Speed Queen On-Premise laundry equipment is built for powerful and long-lasting performance that can be relied upon to make your in-house laundry more productive. See our product range below, and feel free to contact us with any questions. Our heavy-duty construction provides reliable operation and guarantees your washer-extractor will be in service for years to come. That’s why our large door design makes loading and unloading easy, while our improved door locking mechanism is designed to withstand the rigors of commercial use. The powerful operation of a washer-extractor often requires that the machine be bolted to the floor. Our heavy duty suspension absorbs vibrations without the need for special foundations, and our stainless steel construction prevents the washer finish from corroding with normal use. Our top load washers are constructed from heavy-duty components to ensure an extended life on your laundry investment, including a stainless steel washtub, all-metal transmission and a commercial-grade cabinet finish. 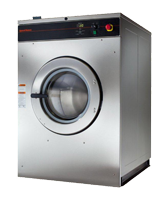 Our line of stack tumble dryers provides double the capacity of Speed Queen single pocket tumble dryers while using only half the floor space. Plus, our patented oval cylinder perforations solve a common, highly damaging problem, by allowing stray screws to pass through without doing large amounts of damage to the dryer’s sweep sheets.